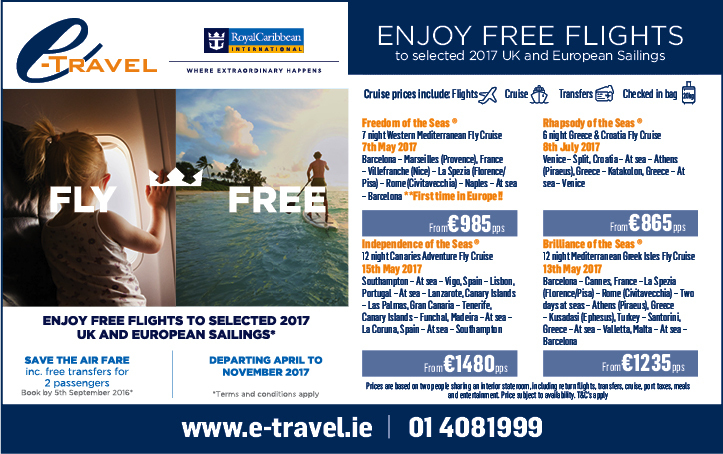 Free flights on selected 2017 European Cruises! 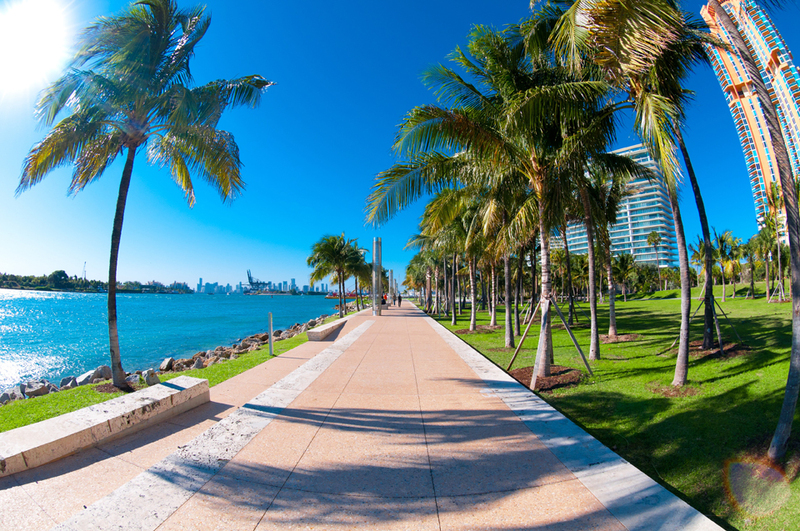 14 night Fly Cruise from Barcelona to Tampa, from only €1295 per person... including FREE Ultimate Drinks Package! 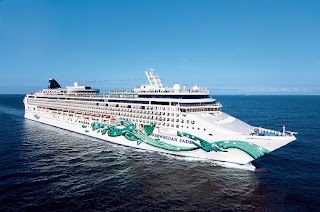 Cruise from Barcelona to Tampa on board Norwegian Jade, departing 30th October. Our amazing price includes return flights, transfers, 14 night cruise, Ultimate drinks packages and all taxes. Ports of Call: Barcelona - Cartagena, Spain - Malaga, Spain - Funchal, Madeira- Bermuda and Miami. Your dream vacation is waiting on the Norwegian Jade. As you cruise from port to port along stunning coastlines, we'll keep you entertained day and night with exciting nightclubs, award-winning restaurants, a grand casino, swimming pools, a pampering spa and so much more. There's tons of fun for kids too, so bring the whole family and enjoy the adventure of a lifetime. 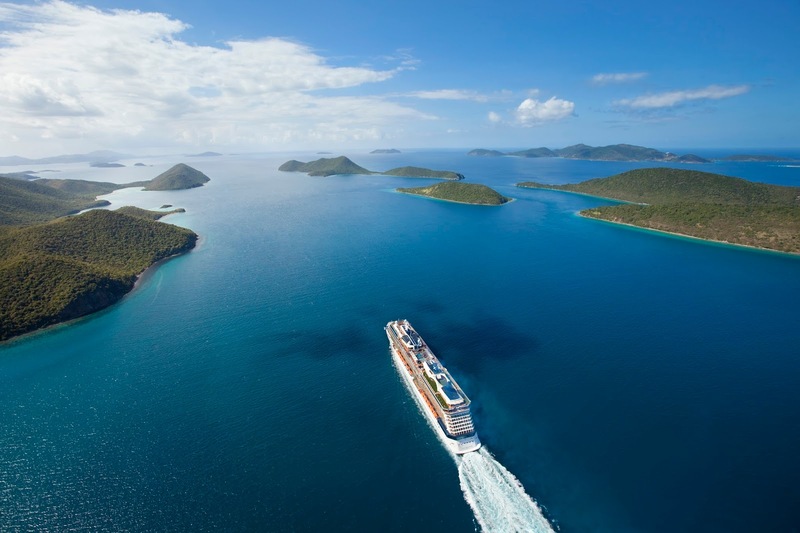 It's no wonder we are the World Travel Award winner for "Caribbean's Leading Cruise Line" and eight-time winner for "Europe's Leading Cruise Line." To book call our cruise department on 01 4081999. Book a selected 2016 European holiday of six nights or more by 1st August and enjoy the all-inclusive treatment, with a complimentary Select or Soda drinks package for the first and second guest in your stateroom. How refreshing! Great news!! Celebrity Cruises is introducing new summer Caribbean sailings in 2017 for the first time in five years. The 2,850-guest Celebrity Equinox will offer 24 itineraries in the most popular cruise region of the world between April and November 2017. This decision was taken following consumer demand for a year-round Celebrity ship in the Caribbean. It is the first time that Celebrity Equinox has sailed in the Caribbean during the summer and means Celebrity is now offering a year-round, modern luxury service in the region. Celebrity Equinox’s summer Caribbean season will launch on 24 April 2017 with a special 11-night sailing with an overnight stay in New Orleans to coincide with the famous Jazz Festival. There are a range of exciting new itineraries across the Southern, Western and Eastern Caribbean, including a special new President’s Cruise hosted by Lisa Lutoff-Perlo in August 2017. There will also be an exciting new onboard programme for Celebrity Equinox’s summer Caribbean 2017 sailings including a Summer Camp at Sea for children, culinary demos, rum and reggae parties on the Lawn Club and brunch and bubbles events. For more information, call our cruise department on 01 4081999. Contemporary luxury lives and sails on Celebrity Cruises. With signature cool, understated design on its award-winning ships, there is an excellent range of shore excursions, superb dining and attentive service. They also have some very good deals available just now. With a bumper collection of 2017/8 cruises on offer, you’re spoiled for choice, with five award winning ships in Europe for 2017/8. The newest, `Celebrity Reflection’, will visit the rivieras of France, Itay and Spain, on the new 11 night ` Best of the Western Mediterranean’ sailing. The new itinerary offers four different stops in Spain, then romantic Florence/Pisa, plus Villefrance for Nice, Gibralter and also an overnight in Barcelona. Seven night cruises on`Celebrity Equinox’ take in iconic cities and sights, including Cannes, Salerno for the Amalfi Coast, Florence/Pisa and Santorini, plus Sete. 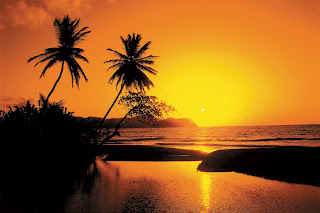 Throughout the season, Celebrity Equinox will offer overnights at ports of call, including Barcelona and Ibiza. 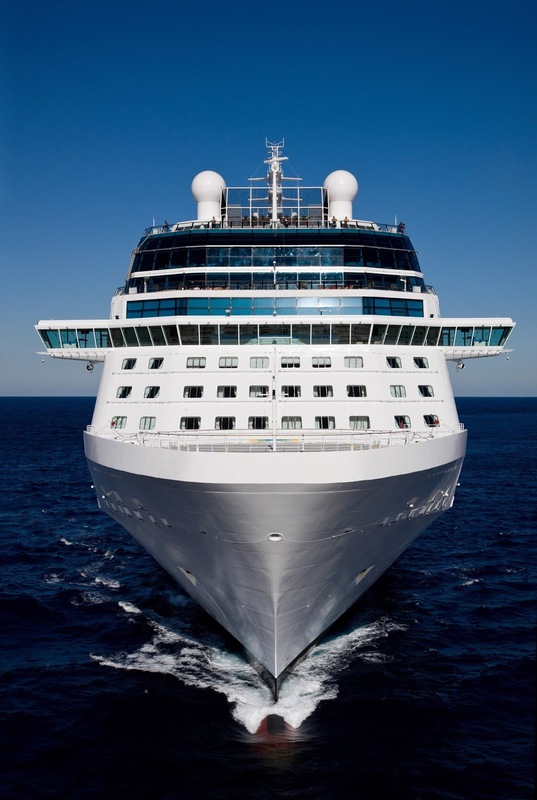 If you’re looking for a longer cruise, Celebrity Constellation has a variety of 9 and 10 night Mediterranean sailings, taking in new destinations Monte Carlo and Sete. Look forward to an emphasis on `Destination Experiences’, with new shore excursions. How about joining one of the new Chef hosted excursions? `Chef’s Market Discoveries` tours inspire foodies for that night’s dinner. On shore excursions , mingle with your own Merchant of Venice, exploring the Rialto food market,or enjoy a paella lunch at a Valencia`baracca.’ You can also delve deeper into local culture. How about getting in touch with your inner Onassis on a `Celebrity Exclusive’ private luxury boat tour of secluded coves and beaches in the Greek Islands ? For total luxury, how about a shore excursion to a premier sporting event? The `Celebrity Eclipse’ will take in the French Open – with VIP tickets to both Finals. Also on the lists - The British Open, the Royal Edinburgh Military Tatoo – and the Cannes Film festival. If you can’t wait that long, Celebrity Eclipse departs Southampton on 16th October 2016, for a 13 night Fly/Cruise, at taking in Vigo, in Spain, Funchal for Madeira, Teneife, Gran Canaria and two days in Lisbon, before returning to Southampton. Prices start from €1479, including flights, transfers, all meals entertainmment and taxes. Celebrity Eclipse is noted for her decor, her wide choice of dining options in 10 restaurants, including innovative Qsine. There is a wealth of choice of bars and lounges, activities for mind, body and soul plus top entertainment and shows. To keep the fun going, drinks range from craft beers to freshly frozen drinks in a range of flavours! SEE MORE. DO MORE. GET MORE. What’s new on the big blue! 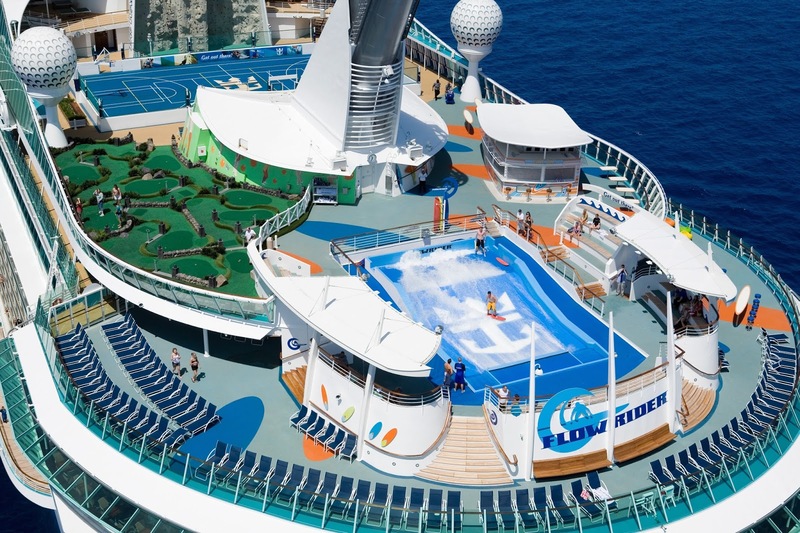 From sky-diving simulators and top deck picnic lawns to planetariums and vertical-drop water slides, cruise ship design has reached a whole new level as shipping companies go to extremes to attract passengers. Now the cruise giants are battling to offer the best incentives to book early for 2017 with ‘free flights, buy one cruise fare get one half price, free upgrades, free drinks packages and lots more. Cruising is becoming increasingly popular with Irish holidaymakers with over 35,000 people expected to hit the high seas by the end of 2016. According to top Irish cruise agency e-travel, it is the fastest-growing sector of the holiday market and with some clever planning, there are now some great bargains on the big blue! 1. In May 2017 MSC will launch MSC Meraviglia which will become the largest ship in the world (beating Oasis, Allure and Harmony of the Seas), holding a maximum capacity of 5,700 passengers and 1,536 crew members. The ship will feature Cirque de Soleil at sea, The Carousel Lounge - a circular performance space with a 180° circular glass wall and a Mediterranean-style indoor promenade, which will feature an 80-meter LED "sky" that changes throughout the day. It will be the social centre of the ship, featuring shops, restaurants and bars. It will also be home to the nightly parades with the ship's onboard performers. The ship will also have a double-deck indoor amusement park and a double-deck aft lounge and entertainment space. 2. 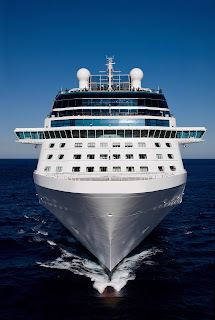 Modern luxury cruise brand Celebrity Cruises will have five award-winning ships in Europe for 2017-2018 – Celebrity Reflection, Celebrity Equinox, Celebrity Constellation, Celebrity Eclipse and Celebrity Silhouette. The premium line’s richest season yet offers 86 overnights in 24 vibrant cities and four double overnight stays in Europe. New for Celebrity Cruises, Celebrity Eclipse will take guests to one of the premier sporting events of the year: The French Open. This holiday includes VIP tickets to the men’s and women’s final matches. 3. Popular Cruise Line Royal Caribbean International will be bringing their Freedom of the Seas Ship to Europe for the 1st time sailing from Barcelona for Summer 2107. Freedom of the Seas is one of the most popular ships with Irish People cruising in the Caribbean because it has incredible features such as a Rock Climbing Wall with eleven routes up; a spectacular FlowRider surf simulator, a waterpark, cantilevered whirlpools stretching out over the ocean and the magical DreamWorks experience for families. 4. 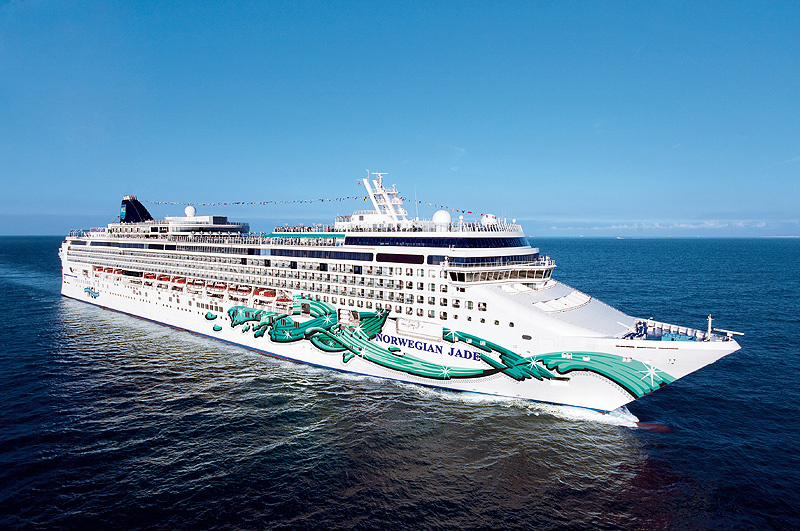 Norwegian Cruise Line (NCL) has announced its ground-breaking summer 2017 deployment for Europe that, for the first time in company history, features five ships sailing in European waters in the summer season. Highlights of the new itineraries include cruises to the Baltic Capitals on Norwegian Getaway from Copenhagen and a first ever complete season from Hamburg on Norwegian Jade, with embarkation for those cruises also available in the UK and Amsterdam. In addition to the European sailings, Norwegian also revealed details on Norwegian Escape’s 2017 summer cruises to the Caribbean from Miami. 5. The 40,000-ton Silver Muse arriving in Spring 2017 will be the largest ship in the Silversea fleet and the first vessel in a new three-ship class. Silversea describes the intimate 596-passenger ship as a step toward "ultra-luxury ocean cruising." It will feature all-suite accommodations and a supper club-style specialty restaurant. Royal Caribbean is offering free flights to selected 2017 UK and European sailings for the first & second guest including free transfers and taxes. The Free Flights promotion is applicable only to new bookings made between 5th July & Monday 5th September 2016 on selected sailings of 6 nights or more departing from selected airport gateways to the 1st & 2nd guests in the booking only. Additional passengers will pay the full airfare at the time of booking. The Free Flights promotion is applicable to departures with a duration of 6 nights or more from a range of Irishnd airports on selected UK & European 2017 itineraries onboard Brilliance of the Seas, Freedom of the Seas, Independence of the Seas, Jewel of the Seas, Rhapsody of the Seas, Navigator of the Seas, Serenade of the Seas & Vision of the Seas. To book call our cruise team on 01 4081999 or book online today! Good morning, a number of flights to and from Ireland have been cancelled due to another strike by French air traffic controllers. It is the 13th strike in 14 weeks. Passengers due to travel today have been urged to check the status of their flight. Aer Lingus and Ryanair have cancelled flights into and out of Ireland and also warned of delays to flights that use French airspace. Shore Excursions with Celebrity Cruises!